The GPS educational tour “Religion in Berlin” leads the participants through the center of Berlin and was developed and tested in the context of “ReliXchange – an Interreligious Youth Exchange between Germany and Egypt”. Via buildings, squares and other places the participants deal with the history and present of Christianity and Judaism in Berlin, as well as with questions of how state and society deal with religion and particularly religious minorities in the country. This happens in a playful way by means of answering questions and completing tasks related to the different stations. The tour can be done individually or in groups. Who plans to complete the whole tour needs to calculate with around 4 to 5 hours. However it is possible to do only parts of the tour and chose the stations individually. Moreover, many questions can be answered without even being at the stations (yet in this case points will be deducted). 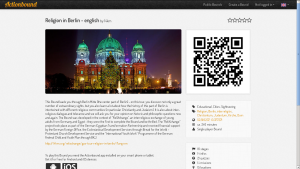 In order to play the GPS educational tour “Religion in Berlin” the App Actionbound is needed. It runs on Android and iOS and can be downloaded free of charge from the App store. This Bound leads you through Berlin Mitte (the center part of Berlin) – on this tour, you discover not only a great number of extraordinary sights, but you also learn a lot about how the histroy of this part of Berlin is intertwined with different religious communities (in particular Christianity and Judaism). It is also about inter-religious dialogue and tolerance and we will ask you for your opinion on historic and philosophic questions now and again. The Bound was developed in the context of „ReliXchange“, an interreligious exchange of young adults from Germany and Egypt – they were the first to complete the Bound and be thrilled. The „ReliXchange“ project took place as part of the German-Egyptian Transformation Partnership and received financial support by the German Foreign Office, the Ecclesiastical Development Services through Bread for the World – Protestant Church Development Service and the “International Youth Work” Programme of the German Federal Child and Youth Plan through BKJ.